The new video is part of an ongoing series aimed at helping anyone wanting to learn about and/or create their own website for personal, professional or business use. We’ll continue to add more and more videos that will help anyone, even if they are not our customers, learn how to get started and manage their own website. 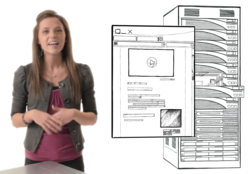 Bluehost today announced the availability of a new video called “How Websites Work” on its YouTube channel. The new video, part of a series of educational videos, is designed to help anyone who wants to learn more about websites and how they work. The video can be seen at http://www.youtube.com/bluehost. What is an eCommerce store? The new videos are part of an overall effort by the company to better connect and help its customers and other interested individuals. The company also recently launched its Facebook page and Twitter social media presence (twitter.com/bluehost or @bluehost). And a new company-sponsored blog will soon augment and complement the company’s YouTube channel with relevant information about setting up and managing websites. Bluehost is a leading provider of shared hosting services and is known for its industry-leading reliability and U.S.-based customer support. Bluehost produces exclusive technology designed specifically for shared hosting and reseller hosting. The company also owns and operates its own data center, domain registrar and nationwide fiber network. For more information, visit http://www.bluehost.com or call toll free (888) 401-HOST.